Co Enzyme Q10 (also known as ubiqinone) is a vitamin like substance which plays a vital role in the body's energy supply mechanism, acting in conjunction with enzymes (hence the name Co Enzyme Q10) to convert sugars and fat into energy. Coenzyme Q10 is also important as an antioxidant within the body. Co Enzyme Quinones occur in several chemical forms, with Co Enzyme Q10 being the only form found in human tissues. The human body is able to synthesize (in the liver) a limited amount of Co Enzyme Q10, with the remainder being obtained from the diet. Rich sources of Co Enzyme Q10 include fish (mackerel, salmon, sardines) and nuts. Under normal circumstances, the body is able to maintain adequate levels of Co enzyme Q10. However, Co Enzyme Q10 levels decrease with age, and are depleted by intense physical exercise or illness. Co Enzyme Q10 levels are also depleted in patients prescribed cholesterol-lowering statin drugs. Bulking agent: Vegetable oil, Capsule shell: Gelatine, Humectant: Glycerol, Coenzyme Q10, Colour: Ammonia caramel, Humectant: Purified water, Colour: Titanium dioxide. 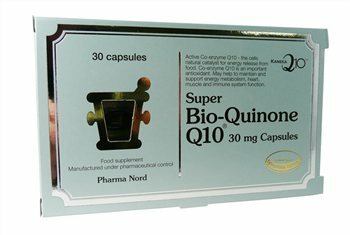 Using 15 years Bio Quinone Q 10Super 30mg and although it was a heavy smoker until 5 years ago my hands and my face are not stained. The hands are much younger than my age (68). It has improved my blood presion that usd to be very low (from 4-9; it has raised to 7-11); has improved energy, memory and concentration.